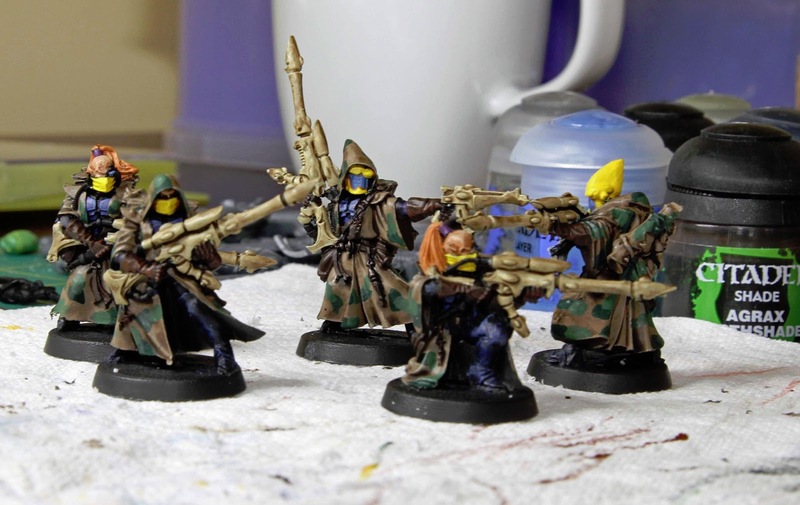 When I last put up a piece on the pathfinders, I was debating camouflage. Despite the advice to just leave them as is I didn't start this challenge to take the easy route, I wanted to stretch myself and my abilities and learn more about painting techniques. Therefore I went for it with the camouflage. Firstly I brought the cloaks down a bit by using a fairly heavy agrax earthshade wash all over them. Letting it pool in the recesses. Then based on a simple camouflage pattern I applied blobs of Caliban green, these were spaced out and i made certain they weren't touching each other and that there was plenty of room around them to continue the pattern with the next colour. The next part of the pattern was to add Waaargh Green so it was overlapping the Caliban green but again not touching any other pattern of the same colour. I also used Rhinox hide on the gloves to simulate leather. The next stage for these will be a light drybrush with Doombull Brown to try and make them look like they're older and worn. Oh you may also have noticed that my Eldar are ginger...I used Jokaero Orange for this and this will be part of the theme running through my force. There's a reason this lot are outcasts you know! The only remaining parts are now the backpacks and the details such as the belts, icons etc. Done except for basing, I haven't decided on a basing scheme for the force yet so that will be on hold till I make that decision. I think I'll look at Rob's piece for inspiration. Next up Harlequins....nothing like going all out! I really want to have a go at the diamond patterning and I found a very useful and I think achievable guide for diamond patterning linked here. 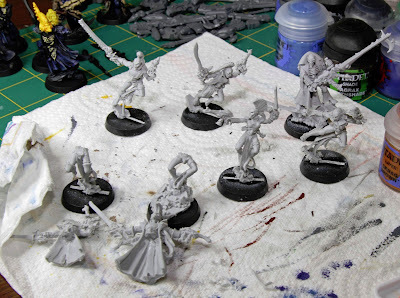 I'm still waiting for my shadowseer to arrive but I can at least make a start on these. as always any comments/criticism is welcomed. I am liking how the pathfinders have turned out. Nice work Ben. The pathfinders are some of the best stuff of yours ive seen. Id personally avoid adding any more colours to the palette so id consider doing the gear and webbing in the same brown as the gloves. Id also not drybrush the highlights on the gloves, paint them on instead. A neater finish that will suit the cleaber lines of the Eldar. Thanks Both. I'm really happy with the way they turned out. I decided to follow the camouflage pattern i'd used for the cloaks on the backpacks so that the flow was consistent. I did like you suggested though James and edge highlighted the gloves so the lines are sharp. Once they're based i'll throw another picture into one of the Tales to show you.